Before my wife and I first started out on Dave Ramsey's plan, we were trying to do many different things at once. We were trying to get out of debt, save, invest for retirement, do discretionary sinking funds, and everything else we could think of all at the same time. I thought that I knew it all and had a plan to work on everything at once and eventually, in 15-20 years time, I would have everything done. I had gone to church and a person I didn't know at the time was standing at the back of the church promoting this financial class that taught you how to get out of debt and build savings and wealth but would cost me $100 to take. Ha! "That was a great scheme to make money!" I thought. But, I remember looking further into it and deciding that we could take the class together as a couple and hopefully, my wife would learn how to handle money better. We talked it over and decided to take the class. As we worked our way through the lessons, I decided that I liked the way this system was laid out better then what I had planned. I remember completely jumping on board and getting very excited about this new focused plan where we got to work on one step at a time. So, here is our story of how we worked through the baby steps and where we are at currently. This is generally considered the hardest step and the easiest step by people. It's the hardest step because if you don't have a budget or plan on how you are going to save your money and live on less than you make, you are going to find it very hard to save up your $1,000 starter emergency fund. However, we were on the other side of the equation in that, we had more than $1,000 saved up already because we were trying to do everything at once. We actually had close to $3,000-$4,000 in our savings at that time. So, we were able to mark baby step 1 off the day we started. This was May 24th, 2011. Debt is a problem that so many people face. There are so many ways to get into debt. We had it all. We had car payments, student loans, personal loans to family members, credit card debt, even debt on our dishes. When we started tracking our debt though, we only had student loan debt left. $27,737 worth of student loans. We had some due to Citibank, Sallie Mae, and even University of Phoenix. My wife ended up with a bachelors in health science. I didn't finish the requirements to even get my associates, but I racked up my share of the loan debt. It took us roughly two years of working hard, living frugally and paying off debt as fast as we could to finally knock out the entire amount of loans. But, we did it and we won't be back. The only thing we still have is our home mortgage that we are working on still. On our vacation to Puerto Vallarta with our daughter before our second daughter was born. During this time, we did do a few things that slowed our progress, but we were OK with that. We went on vacation during this time. We did save up and pay cash for the vacation even though we could have put it towards debt, but we felt it would be okay as long as we weren't taking on more debt. I think we spent around $2,000 for our trip to Puerto Vallarta, Mexico and loved it! And, this vacation was one that the debt didn't follow us home, which was HUGE for us in our mindset change of not using debt. Another thing that we did while getting out of debt was we bought a used vehicle in late August 2012 because our current vehicle (1996 Honda Accord) was going to need a third replacement transmission. We traded in our vehicle and paid cash for our Used 2004 PT Cruiser. Although it was expensive, we have had decent luck with it and still have it today. The only reason that we had the cash for this was because we still hadn't used our savings from the pregnancy to pay down our debt since we had paused our debt snowball to make sure we had enough to cover any emergencies during the pregnancy. This is a chart of the debt snowball from when we actually started tracking. We had more before this, but I don't have records of all that, unfortunately. After working very hard for 2 straight years, we were finally able to pay our last payment on 6/11/2013 and become debt free. I remember the feeling of being done with the loans and feeling like I had just got a huge inheritance or won the lottery because I knew that going forward I would be able to put that money into savings each month instead of paying it to the loan companies. This was such a freeing feeling and I love it to this day. This step has been completed This is the step that we are currently on, but are hoping to be done with here in July or August 2015 as of August 11th, 2015. We decided on a 6 month emergency fund even though we are a two income family and have fairly steady jobs at this time. We have not had any major emergencies since really starting to build our fund, but we have depleted it a couple of times due to random things happening that you can read more in depth about here. The latest time was when we decided to purchase a replacement vehicle for me. 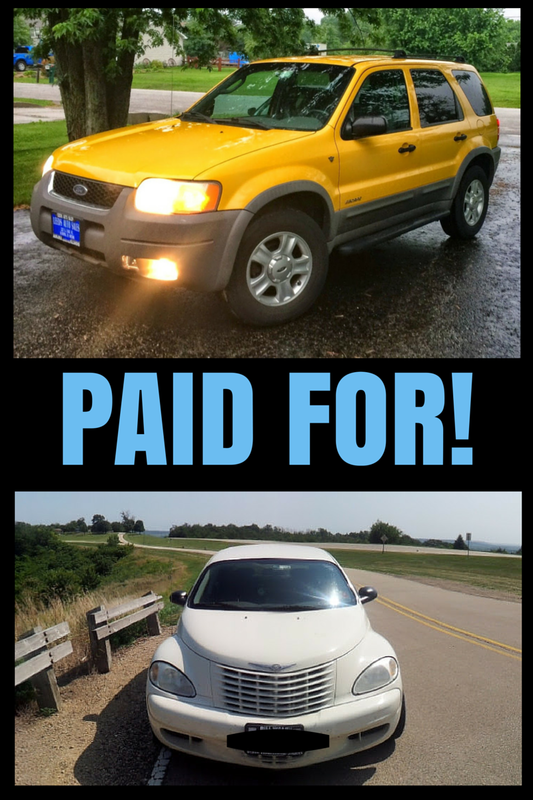 I was driving a 1992 Honda Accord and we ended up replacing it with a 2001 Ford Escape. I have the vehicle today and it drives wonderful. This purchase wasn't as necessary as the other vehicle purchase, but we wanted to move up a little in car and with our second daughter here, we wanted to make sure we had two good vehicles that had AC, and weren't on their last legs since we both end up picking up our daughters from daycare at any given time. We have been diligently building the fund and are finally hitting our goals of getting the fund done and we just park it in an online savings account that makes less than 1% interest monthly, but we just keep reminding ourselves that this money is there to protect us, not to make money. It really feels good to know that this step is complete. We are currently working on funding a couple vacations for next year as well as finishing a couple of warranted home repair projects before making the full dive into baby step 4. Earlier this year, we used our emergency fund yet again to buy another vehicle. This time, we were replacing the Ford Escape. We ended up purchasing a Chevy Impala and selling the Ford Escape ourselves. Since doing that in December, we have fully funded the emergency again with the exception of $600. We expect to have that done in the next couple of months as we aren't stopping our retirement and are building it on one income now. Being that we are living on one income now, we have changed how we are contributing. My wife is now contributing to her 403b to get the maximum match at her work and we are now starting to put money monthly into a brokerage account to grow our investments. We are currently investing about 7% of our earnings at this time. We are slowly upping the contributions so we don't feel the hit as much. We are now currently pursuing this step and are socking away 5% into my wife's Roth 403b in order to maximize her match that will start early next year (she's not vested quite yet until the 12 month mark) and 1% into my 401k until I can up my contributions (December 2015) to take advantage of the match my employer provides. Total, this is only accounting for about 4.3% of our total 15% we are aiming for. This number does not include matches that our employers give. We are hoping to start seeing that number jump drastically once we get done with the extras in baby step 3b and the kiddos get done with daycare and start regular schooling. We are learning quite a bit and are still making some decisions. Both of our workplaces offer a match for our 401k accounts, so we know we will be starting there to get that free money that's offered. As for the rest of the money, we are still debating on whether we want to use a retirement account or just a brokerage account. The retirement account has tax benefits associated with it due to tax deferred growth in the traditional and tax free growth with the Roth. But, we wouldn't be able to pull that money out before we hit 59 and a half and if we save up enough to retire early, it would not be fun to have to make ends meet until we hit that age or if we need that money for some sort of an emergency. The brokerage account doesn't come with the tax benefits, but would allow us to take the money out when we needed it. So, if we wanted to put college savings and other savings into the market, we could do that and have access to it when we needed it. One thing we know is that we are still going to aim to hit the 15% of our gross income to save either way so that we can be sure that we are putting enough away and building wealth quickly. We have two beautiful girls and will definitely be putting away money here for them to go to college someday and want to give them the opportunity to start their life out hopefully with no student loans. Our decision on how we fund baby step 3 will play into how this step works out. We can't wait to have investments flowing, kid's college underway, and be able to find extra money to put towards paying off our mortgage early. We started out with a 30 year mortgage in 2010 with an interest rate of 5.25% and have made normal payments since. Last year, we were able to refinance our home and bring the payoff from 26 years to a 20 year mortgage with only a $20 increase in our monthly mortgage payment, which was completely doable for us. We also were able to get the interest rate down to about 4.625% because we rolled all of our costs into the loan. We are looking to break even on our refinance this November and continue to save money every month after that. I keep getting the itch to start chunking more money away at this to get the total balance down faster, but think that we really need to get some investing underway first. My decision here may change in the future though. This is like the pinnacle of personal finance! Having no debt, a paid for house, investments taken care of, a pile of money in the bank for an emergency fund, and kid's college funded will be a great feeling. People still try to put me off by saying, "you'll always have payments". I don't think so, I may have the normal monthly taxes, insurance, and monthly utilities, but if I can get rid of my mortgage principle and interest payment (currently over $800/month), and only have those small costs each month, I sure could use all that extra money to generate freedom from payments through investments earning money to pay expenses a lot faster. As far as giving goes, my family are Christian and we do give our local church a tithe and have throughout our baby steps since before paying off our debt. I believe that giving is one of the most impactful and fun things that you can do with money. It has changed the way I act. I feel like I am able to use overflow to help pour out into the community to help others and maybe improve life all around us. We are really looking forward to giving more in the future and getting involved in more life change! Posted in Debt Free Stories, Finances and tagged baby steps, dave ramsey, house payment, mortgage, pay off debt, save money. This is a great story of persistence and progress. Keep up the good work! Good, so we are just normal in the “pay off debt” club LOL! We are just about finished with our emergency fund for the second time as well! But, I wouldn’t trade where we are at for where we could have been if we never got our act together and got on the same page! Thanks for stopping by and sharing! Thanks Kemi! I appreciate you stopping by and reading/commenting! If you ever want to share your story, please let me know! A well-thought-out course of action and one which must give you a lot of satisfaction when you sit back and think of all you have achieved so far and all that will be achieved in the future. Thanks Bill! Yes, it is nice to look back on how far that we’ve come and see the mistakes as well! Hopefully, myself and others can learn from them and not have to make them in the future! We also pay our tithing. It is the single biggest deduction from our bank account every month, but I love knowing it is going to help our local and global community.